After a nationwide search, Lois Riess, a 56-year-old woman wanted in two states has been found. After nearly a month-long nationwide search, authorities captured and arrested Lois Riess, a 56-year-old Minnesota woman accused of fatally shooting her husband and murdering another woman to steal her identity. Dubbed "Losing Streak Lois" for her gambling addiction, Riess is suspected of murdering her husband, David Riess, last month and then stealing $110,000 from his accounts. The grandmother is also suspected of killing Pamela Hutchinson, a 59-year-old from Florida, on April 9 and then stealing her identity. The US Marshals Service apprehended her in South Padre Island, Texas, Thursday evening. "I promised all along that Lois Riess would end up in a pair of handcuffs," Lee County, Florida Undersheriff Carmine Marceno said in a statement. "Tonight, she sits in a jail cell in Texas. We are working as expeditiously as possible to bring her back to Lee County to face murder charges." On March 23, David Riess's business partner requested police conduct a welfare check on Reiss as he had not been seen for a couple of weeks. Deputies from the Dodge County Sheriff's Office in Minnesota found David Riess's body at the family's home. He had been shot several times and had been dead for an "undetermined amount of time," authorities said. His wife, Lois Riess, could not be located. The Dodge County Sheriff's Office tracked Lois Riess to a casino in Iowa, but she had left by the time officials arrived. Minnesota authorities have charged her with second-degree murder in David Riess's death. She is also accused of stealing money from his bank account. 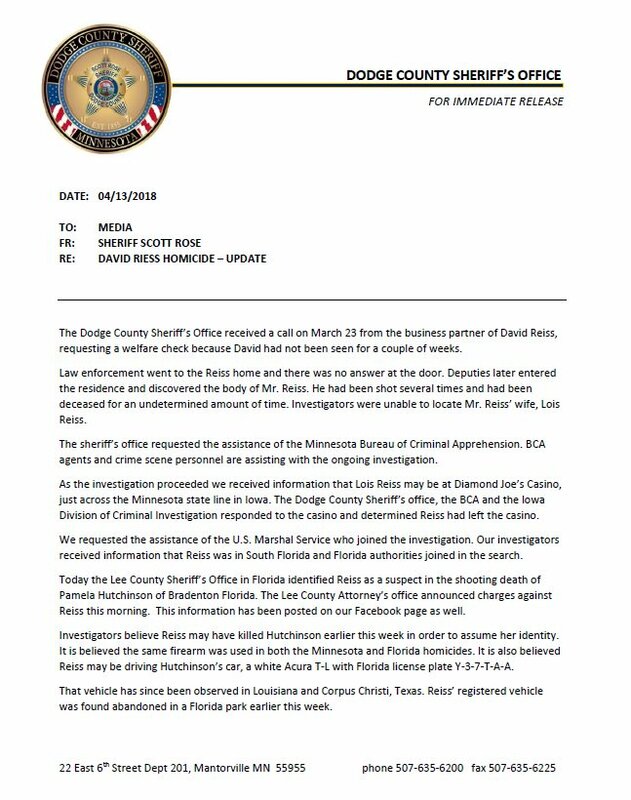 Two weeks later, Florida authorities identified Riess as a suspect in the murder of Hutchinson, who was fatally shot in Fort Myers Beach on April 9. Hutchinson's cash, credit cards, and identification were found missing, as were her car keys and vehicle. The Lee County Sheriff's Office said that Riess targeted Hutchinson due to similarities in their appearance. Police believe the same firearm was used in the fatal shooting deaths of David Riess and Hutchinson. Lois Riess is believed to be driving a stolen, white Acura registered in Hutchinson's name. Police said Riess's "mode of operation is to befriend women who resemble her and steal their identity." The Lee County Sheriff's Office released surveillance video showing Riess talking and smiling with Hutchinson at the Smokin Oyster Brewery in Fort Myers Beach on April 5, four days before Riess allegedly killed her. Riess is seen wearing a pale blue shirt in the video. Authorities said that Riess fled Florida, traveled through the Gulf states, and was believed to have been seen in Corpus Christi, Texas, before her capture in South Padre Island. Riess is the mother of three adult children as well as a grandmother, Dodge County Sheriff Scott Rose told ABC News. He said that Reiss has a "gambling problem" and "financial problems." "She smiles and looks like anyone's mother or grandmother," Marceno told the Today Show. "Yet she is calculated, she’s targeted, and she's an absolute cold-blooded killer," he said. Marceno had told Wink News that Riess could be "anywhere," suggesting that she might cross the border and head to Mexico. He said that she loved to gamble and loved casinos. Marceno also warned that Riess would, at some point, run out of resources. "She will become more desperate and may kill again," he said. Fort Myers Beach was misspelled in an earlier version of this post.